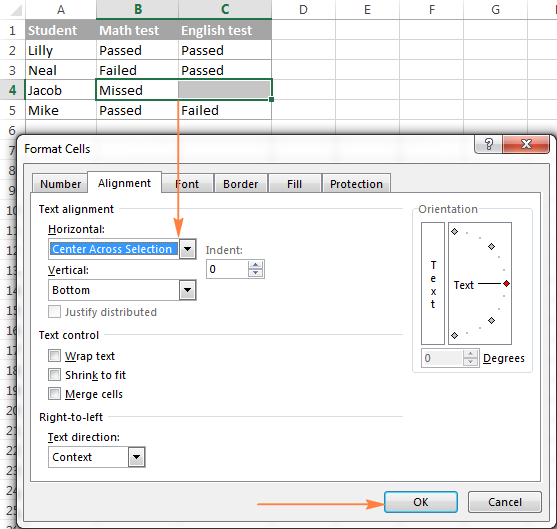 The tutorial demonstrates different techniques to quickly merge two cells in Excel and combine multiple cells without losing data in Excel 2016, 2013, 2010 and lower. 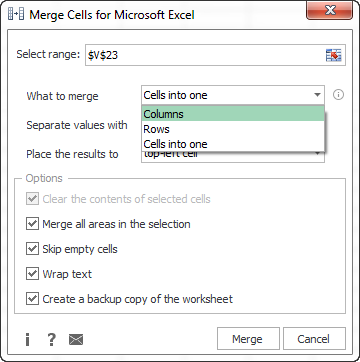 In your Excel worksheets, you may often need to merge two or more cells into one large cell. For example, you may want to combine several cells for a better data presentation or structure. In other cases, there may be too much content to be displayed in one cell, and you decide to merge it with adjacent blank cells. Whatever the reason, combining cells in Excel is not as straightforward as it may seem. 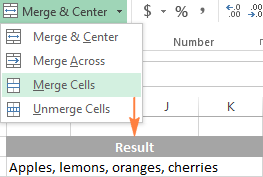 If at least two cells you are trying to join contain data, the standard Excel Merge Cells feature will only keep the upper-left cell value and discard values in other cells. But is there a way to merge cells in Excel without losing data? Of course there is. And further on in this tutorial, you will find a few solutions that work in all versions of Excel 2016, Excel 2013, Excel 2010 and lower. Select the contiguous cells you want to combine. In this example, we have a list of fruits in cell A1 and we want to merge it with a couple of empty cells to the right (B2 and C2) to create a large cell that fits the entire list. Tip. To change the text alignment after merging, simply select the merged cell and click the desired alignment in the Alignment group on the Home tab. Make sure that all the data you want to include in a merged cell is entered in the left-most cell of the selected range because only the content of the upper-left cell will survive after merging, data in all other cells will be deleted. If you are looking to combine two or more cells with data in them, check out How to merge cells without losing data. If the Merge and Center button is greyed out, most likely the selected cells are in Edit mode. Press the Enter key to cancel the Edit mode, and then try to merge cells. None of standard Excel merging options works for the cells inside an Excel table. You have to convert a table to a usual range first (right click the table and select Table > Convert to Range from the context menu), and then combine the cells. It's not possible to sort a range containing both merged and unmerged cells. This is a quick and easy method of merging cells keeping all their content. However, it requires that all the cells to be merged reside in one area in one column. Select all the cells you want to combine. 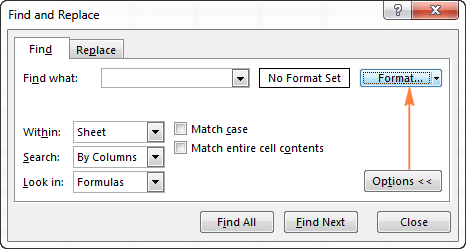 Make the column wide enough to fit the contents of all cells. On the Home tab, in the Editing group, click Fill > This will move the contents of the selected cells to the top-most cell. Click Merge and Center or Merge Cells, depending on whether you want the merged text to be centered or not. If the combined values spread across two or more rows, make the column a bit wider and repeat the process. Using Justify you can only join cells in a single column. It works for text only, numerical values or formulas cannot be merged in this way. It does not work if there are any blank cells in between the cells to be merged. 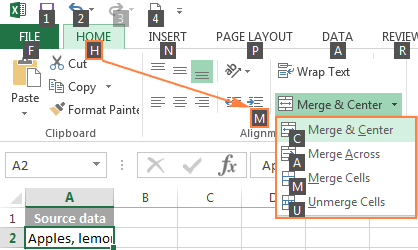 To be able to merge two or more cells in Excel without losing data and without extra "tricks", we created a special tool - Merge Cells for Excel. Using this add-in, you can quickly combine multiple cells containing any data types including text, numbers, dates and special symbols. Also, you can separate the values with any delimiter of your choosing such as a comma, space, slash or line break. Choose Cells into one under "What to merge". Select the delimiter under "Separate values with". Specify the cell where you want to place the result: top-left, top-right, bottom-left or bottom-right. Make sure the Merge all areas in the selection option is selected. If this box is not checked, the add-in will work like the Excel CONCATENATE function, i.e. combine the values without merging the cells. Apart from joining cells, this tool can quickly merge rows and columns, you just have to select the corresponding option in the "What to merge" drop-down list. 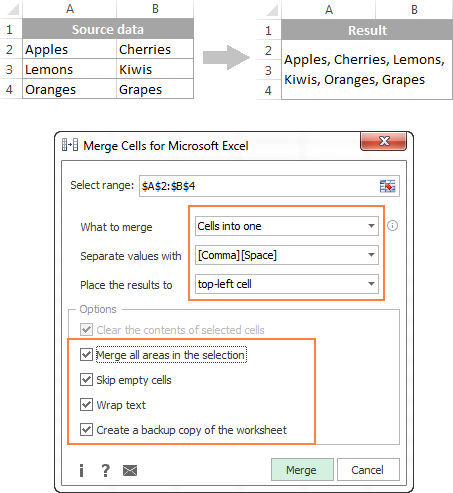 To give the Merge Cells add-in a try, you are welcome to download the evaluation version that works with Excel 2016, 2013, 2010, 2007 and 2003. 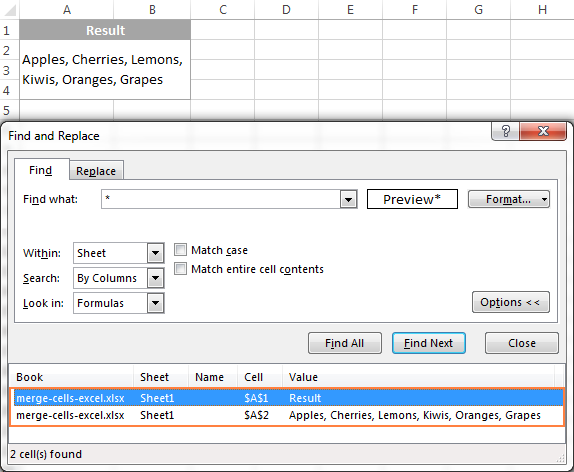 Users who feel more comfortable with Excel formulas, may like this way to combine cells in Excel. You can employ the CONCATENATE function or Excel & operator to join the cells' values first, and then merge the cells if needed. The detailed steps follow below. Copy the cell with the CONCATENATE formula (D2). Paste the copied value in the top-left cell of the range you want to merge (A2). To do this, right click the cell and select Paste Special > Values from the context menu. Select the cells that you want to join (A2 and B2) and click Merge and Center. You can find more formula examples in the following tutorial - CONCATENATE in Excel: combine text strings, cells and columns. If you merge cells in your Excel worksheets on a regular basis, you may find useful the following Merge Cells shortcut. Select the cells you want to merge. Press the Alt key that provides access the commands on the Excel ribbon and hold it until an overlay appears. Hit H to select the Home tab. Press M to switch to Merge & Center. At first sight, the merge shortcut seems a bit long-winded, but with a little practice you may find this way to combine cells faster than clicking the Merge and Center button with the mouse. Press Ctrl + F to open the Find and Replace dialog, or click Find & Select > Find. On the Find tab, click Options > Format. 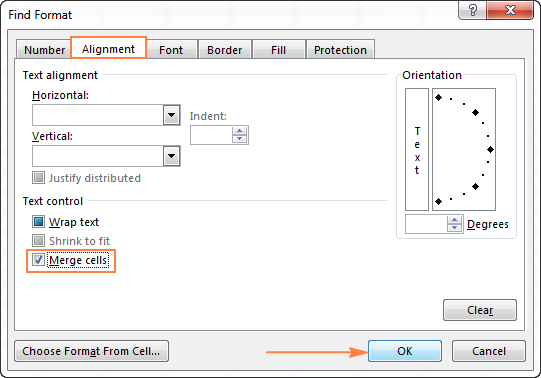 On the Alignment tab, select the Merge cells box under Text control, and click OK. If you changed your mind immediately after merging cells, you can quickly unmerge them by pressing the shortcut Ctrl + Z or clicking the Undo button on the Quick Access Toolbar. After unmerging the cells, the entire contents will appear in the top-left cell. You can't sort a column with merged cells. Neither AutoFill nor Fill Flash feature works if a range of cells to be filled contains merged cells. You cannot turn a range containing at least one merged cell into a full-fledged Excel table, let alone a pivot table. So, my advice would be to think twice before merging cells in Excel and do this only when really needed for presentation or similar purposes, e.g. to center the table title across the table. Select the cells that you'd like to join, B4 and C4 in this example. Switch to the Alignment tab and select the Center Across Selection option from the Horizontal drop-down list, and then click OK. 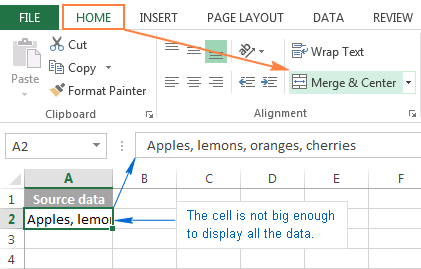 This is how you can combine two cells in Excel or merge multiple cells without losing data. Hopefully, this information has proved useful for your day-to-day tasks. I thank you for reading and hope to see on our blog next week. 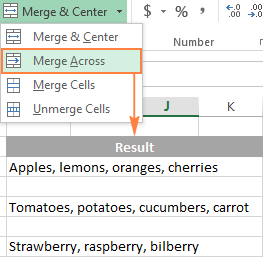 Merge Cells add-in for Excel - quick way to merge multiple cells, rows and columns. How to merge rows in Excel without losing data - how to quickly merge multiple rows without losing data; combine duplicate rows, repeatedly merge blocks of rows and consolidate matching rows from two different spreadsheets. How to merge two columns in Excel without losing data - three methods to combine columns keeping all the data. 13 Responses to "How to merge cells in Excel without losing data"
I have a one of the columns with sequentially repeated values. I am looking for a shortcut or the easiest way to merge the cells with same values with in the column without impacting any other columns/Rows. Please let me know if you have any simple ways. You can use the macro below to merge values in the first column of the selected range. But please create a backup copy of the book. Also, you can use our Duplicate Remover add-in to select duplicates. Then you can delete them. In this case cells will not merged. How to merge cells with two different cells with some cells containing the first, last name and the other cell containing first, last middle initial? You can take the following macro as a template and modify, if necessary. into two different columns without commas. Is this possible? If yes than how? This page will show you how it will look (see Data preview). If it looks good then click Finish. If you click "next" you can format the cells if need be (such as number, text, etc). I have to merge the cells again & again for my business packing list but i don`t know what is the short key of merging cells or if there is no such key then how to set a formula which would merge alternate cells by applying one short key instead of clicking the MERGE & CENTER button with mouse. i have tried aforementioned formula but it is not working after once. can someone help that how it would work continuous? Hi, I am using an advanced filter on a column of data that contains country headings. Each country takes up three rows of data e.g. And so on. I want to merge the countries but keep the data in each cell. I know I can use the format painter to do this but this makes further updating of the spreadsheet difficult for users who do not know what I have done. Is there a way I can format the cells to fix this problem? Further to this, when merged, the data cannot all be sorted alphabetically, so at the moment I have to run a macro to unmerge the cells, sort, and then remerge them using a format painter. If there is a way to avoid using the merge button itself, and achieve the same result that would be perfect. i have below data in 2 column and i need data same data against Each code in one Cell. I want to merge multiple cells based on other cells.of other cells are merged, target cells automatically will merge and sum two values. If I merge A1 & A2, then D1 & D2 will merge automatically and will sum C1 & C2. I have a the following work and I need help. I have A column which has several codes "427, 540,etc" random codes like that. Each code has a list of skills associated to it in column B distributed in different cells along several rows on column B. I need to be able to merge all the skills that belongs to one code for example 427 which goes from A:2 to A:20 into one cell in column C without loosing data and then repeat the same process for the rest of the codes in A. so I will have Column A - header : Key Column B Header:Skills Column C: concatenated list of skills by code. A:2 to A:19 (under the "key" header) I have code 427, for code 427 from B:2 to B:19 I have listed skills, on C:2 I need the listed skills from B:2 to B:19 into that cell (C:2). And repeat the process for "key" 540. Note that the number of cells occupied by skills will differ by each code. Also I need using the code below be able no not having to input myself the cell where I want the merged skills, I want them on the same row that I have the New "key"